Ali Siddiq is stand-up comedian, public speaker, and writer out of Houston. His unique style of stand-up began behind the walls of incarceration, an incubator for interesting experiences and good stories. People received their first taste of Ali Siddiq when he appeared on HBO's DEF COMEDY JAM and LIVE FROM GOTHAM, and in 2013 he was named Comedy Central's "#1 Comic to Watch".Ali impressed comedy enthusiasts by displaying his ability to captivate an audience with his "Mexicans Got On Boots" tale, a descriptive storytelling of a prison riot on THIS IS NOT HAPPENING, the first of three appearances. His stories continued with his HALF HOUR special, which premiered on Comedy Central in the fall of 2016. Immediately following the premier of that special, Comedy Central offered Ali an hour-special where he performed for inmates live in a Texas jail, sending Ali back to where it all started. 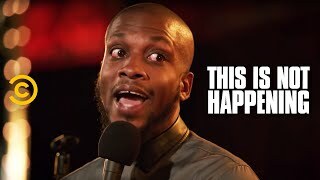 The hour special, Ali Siddiq: It’s Bigger Than These Bars, premiered February 23, 2018 on Comedy Central.